New for 2007! 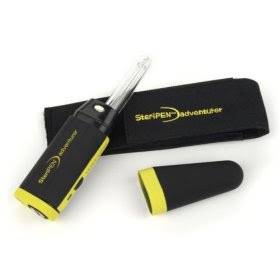 At a mere 4 ounces, the SteriPEN Adventurer water purifier is ideal for backcountry hiking and camping trips. Utilizing the same technology used to purify water in municipal treatment facilities, hospitals and water-bottling plants, the Adventurer destroys viruses, bacteria and cysts, including Giardia and Cryptosporidium, by using high-energy Ultraviolet (UV) light. The Adventurer is easy to operate and purifies water quickly and efficiently without the need for chemicals or pumping. The Adventurer makes purifying water a cinch. Simply fill a 16 oz. or 32 oz. glass, plastic, ceramic or metal container with clear water, push the activation button once for 32 oz. or twice for 16 oz., dip it in the container and stir slightly to agitate the water. Ultraviolet light is invisible to the human eye, but a visible blue light indicates that the Adventurer is working and shuts off as soon as a full dose has been delivered. The Adventurer purifies 16 oz. of water in 48 seconds and 32 oz. in 90 seconds! The UV light breaks down the DNA of viruses, bacteria and cysts, rendering them harmless. Because the penetration of UV light can be limited by discoloration, solids and debris, it is important that clear, unfrozen water be used. The SteriPEN Water Bottle Pre-Filter (sold separately) can be employed to filter particulate-filled water before UV treatment takes place. The Adventurer is powered by two CR123 rechargeable batteries (included). The Adventurer’s electronics are designed to activate only as long as there is enough battery power available to produce the required UV dosage, so there is no risk of an inadequate dose as batteries run low.